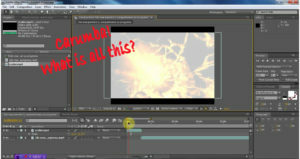 I’ve been learning a new computer program recently (I guess they’re called “apps” now): Adobe After Effects. One tutorial called it “massive”, and that it “takes years to master”. It’s Photoshop with movement. Lots of movement. I mean, if you can imagine it, AE can do it. See, when you’re a writer of fiction, you tend to hear voices. Not the evil kind that tell you to do things upsetting to others (not usually, I hope), but the kind where your brain keeps turning over who a character is, what they’re about, and what they’re going to do in your story. So it’s nice to find a pursuit that lets you focus on something else for a while—not because you’re trying to shut out the voices, but so they can simmer and meditate; when you come back to them, often your subconscious has figured out a whole bunch of aspects about their personalities, and off you go. I mentioned in the “Author’s Note” at the back of “For Weeds Will Grow” that this getting-acquainted process is one of the best parts of being a “pantser” (as in, writing by the seat of one’s). I’ve heard other pantser authors say they are compelled to write their story so they can find out what happens. I know what they mean. Sure, I have a broad idea where it’s going, and usually how it will end. But when I start writing, I often don’t know the individual steps it will take to get there, where the train’s gonna stop on its way to the end of the line. This discovery process is the other best part of pantsing: meeting someone you thought you knew inside out, only to discover that they are a completely different person than you’d thought they were. Not so good for real life, but makes for some great tension in suspense fiction when a character you thought was good turns out to be an angry killer. Speaking of angry, have you noticed the trend among some automakers—notably Ford and BMW—to give what one might call a grumpy personality to some of their models’ grills? The Ford Fusion comes to mind, with its “What’re you lookin’ at?” grill (the featured image for this essay). One might call that expression sarcastic. You may be wondering what apps and car grills have to do with writing. Well, it’s all characters at the base: the big Adobe app gives the brain a diversion while the characters break up into small discussion groups to figure out just who the heck they are, and what they have to do with the story I’m writing. The car grills… Well, that’s just fun rumination while on the road. No, I’m not planning to write about a possessed car; that’s been done, and about as well as it ever could be (Christine). This is more about attributing personalities to anything that catches my eye—even cars. It keeps the juices flowing, and if you’ve read my work, you know I might, on rare occasion (ha), include an off-the-wall analogy or metaphor. When I write, it’s all about the characters. They define the story for me, not the plot. People don’t get up in the morning with a plot of their day in their heads. Sure, they may have plans, but that’s different. How often have you had plans that got derailed for some unexpected reason? And had to go off in a completely different direction for the rest of the day than you’d expected to do, or even would have liked to do? Some other character in the story of your life, or some event propelled by a character in your life, changed your plans for the day. And in writing, when the sudden unexpected derailment is interesting enough, we have a plot point that drives the story forward. Take Bruno in the “Bruno & Salvanian” series (book 2): Our hero gets out of bed, expecting to go straight to the fridge and get his morning Anchor Steam beer, but instead finds a naked girl in his bed that he doesn’t remember putting there. That’s a pretty significant derailment of his plans, and that one event starts the drive to all the other events that happen in the book. So through frowny car grills and huge, distracting computer apps, it’s all writing. It all happens all the time, whether my fingers are tapping out letters on the keyboard or not. Sometimes the best plots come to you at three in the morning. Hard on the sleep, but so much fun for the story. Let me know what you think in the comments below–what do you do to distract yourself from the intense focus of your life? To give your brain some recharge or down time? Are you the fresher for it when you go back to your work? What sort of things might you like to do, but don’t have the time or opportunity? If you need to get in touch with me, use the Contact form I’ve set up for that purpose. And if you enjoyed this article, consider using the buttons below to share with your social media followers. Thanks! Very creative article, David! Thanks for your insights. And I agree with your comments on the writing process. I do allow my characters to write their own story too having a general direction in mind. Keep sharing your thoughts and I will read them.